Seattle Mayor Ed Murray announced a proposed property-tax levy Wednesday to collect $900 million for transportation spending over nine years. Murray’s November ballot proposal would more than double the amount voters approved in 2006. If Seattle Mayor Ed Murray has his way, Seattle voters will see a $900 million transportation levy on the fall ballot, with the property taxes collected over nine years. He is asking voters to dig deep. The annual rate for the nine-year levy would be $61 per $100,000 of assessed property value. The current $365 million Bridging the Gap levy, which expires this year, collected $36 per $100,000 of property value annually. The City Council will now weigh in, and can change the amount and the projects included. Voters would make their decision in November. Mayor Ed Murray’s nine-year proposal, including descriptions of the 24 leading projects for streetcars, busways, freight, bike trails, road retrofits, and pedestrian safety, can be found at http://www.seattle.gov/transportation/docs/MoveSeatte-FinalDraft-2-25-Online.pdf. Source: Seattle Department of Transportation. Murray announced his proposal Wednesday at the corner of 15th Avenue and Madison Street, served a century ago by cable cars. Some 11,000 people a day ride buses now on Madison Street, where the city plans a $120 million retrofit to give Metro Transit’s electric trolley buses their own lanes. It’s a highlight among two dozen projects in the mayor’s Move Seattle plan, which includes bus and streetcar corridors, sidewalk and street work, freight routes and bicycle lanes. While the measure wouldn’t replace major bridges, it does set aside $25 million for preliminary studies and engineering to replace aging bridges, including the Ballard Bridge. In the meantime, the Seattle Department of Transportation (SDOT) would make improvements in the tight walkways of the old Ballard Bridge, said Director Scott Kubly. Kubly said the levy would replace the shallow Fairview Avenue bridge near the Fred Hutchinson Cancer Research Center, the last city bridge built on timbers. 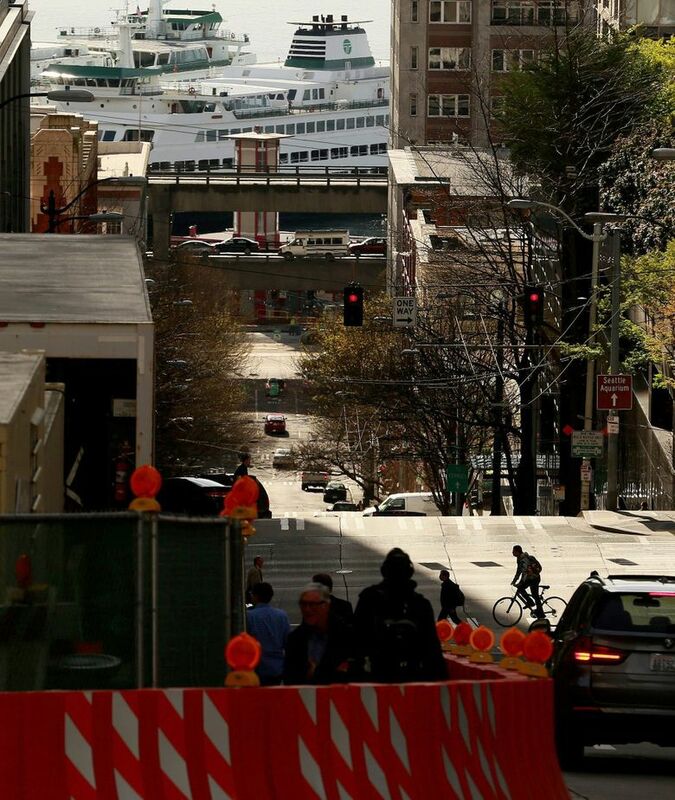 SDOT opened an online survey asking the public to rank priorities. Murray was asked if the city is squeezing out car drivers, for instance through a safety-related lane reduction on 23rd Avenue, or the ongoing loss of curbside parking to created transit lanes. “The mode wars are over,” Murray said. Yet, he argued the city’s transportation network must evolve. Over the levy’s nine years, some 60,000 new residents will arrive, he said. Seattle’s current population is 640,500. Nonetheless, the proposed property-tax bill, estimated by the city at $275 per year for a midrange $450,000 home, raises questions about whether it would harm the middle class and accelerate Seattle’s trend toward becoming a city of the wealthy and the poor. Murray answered that Seattle families spend 17 percent of income on transportation, and better travel options would reduce that burden. He also said Seattle still has low tax rates compared to U.S. major cities. On the other hand, people here pay a number of state taxes and regional transit taxes, including a high sales tax, that make Washington the most regressive state in national comparisons. Seattle voters have sided with Murray on parks spending, a $60 car-tab fee for more bus service, and subsidized preschool. The political psychology might be simpler this year. Murray anticipates city voters in November could see only one request — this one. Still, this levy would more than double the $365 million levy approved in 2006, during the Greg Nickels administration. Safety was presented Wednesday as the top priority. Nine to 12 schools a year would be outfitted with sidewalks, new road crossings or other improvements, Kubly said. There would also be seven to 10 rebuilt transit corridors over the nine years, including Madison Street from the waterfront to at least 23rd Avenue. Some 280 lane miles of roadway would be rebuilt, repaved or sealed, compared to 200 lane miles under Bridging the Gap, said Kubly. All the money would go to capital projects, he said. One new proposal is to spend $10 million toward a possible Sound Transit rail stop, at South Graham Street and Martin Luther King Jr. Way South. The levy also would put $20 million in seed money toward a South Lander Street freight overpass in Sodo, debated since the early 1990s. The crossing requires around $150 million. Asked why anyone should expect SDOT to find that much cash, Kubly noted the state Senate, in its proposed 11.7-cent gas tax increase, listed money for Lander. However, the lawmakers offered only $5 million — an amount Murray said last month was too low. The safety argument for Lander has only gotten stronger, as transit and cargo trains increase, Kubly said. The Seattle Metropolitan Chamber of Commerce both praised and criticized the levy, in a statement. The group endorsed transportation investments, citing in particular road repaving and the Lander Street overpass. But it accused the city of trimming general-fund aid to transportation in recent years. “Levies should help the city expand its ability to make investments — when they serve as backfill instead of extra capacity, we’re all losing out,” the chamber asserted.